The tablet market is still on fire. Q1 2013 saw only slightly fewer devices shipped than Q4 2012 (49.2 million units worldwide versus 52.5 million units), despite not being a holiday quarter. Apple’s iPad once again took first place, although it slipped slightly to 39.6 percent market share, and Samsung grew its share to 17.9 percent in second place. The rest of the top five changed a lot: Asus muscled its way into third place by grabbing 5.5 percent, Amazon fell to fourth with 3.7 percent, and Microsoft snuck its way into fifth by capturing 1.8 percent. IDC attributes Apple’s lead in the market with 19.5 million units thanks to sustained demanded for the iPad mini as well as moving the new iPad launch to the fourth quarter of 2012. The latter helped the company avoid the typical first-quarter slowdown that traditionally follows as consumers held off buying in January and February in anticipation of a new product launch in March. In fact, this strategy helped Apple outperform IDC’s projections for the quarter. Still, while the company managed a 65.0 percent shipment growth over the same quarter last year, its market share declined for a third time in a row (down from 43.6 percent the previous quarter). Yet Asus made the biggest move, with only a slightly smaller year-on-year growth of 267.6 percent thanks to 2.7 million units shipped. 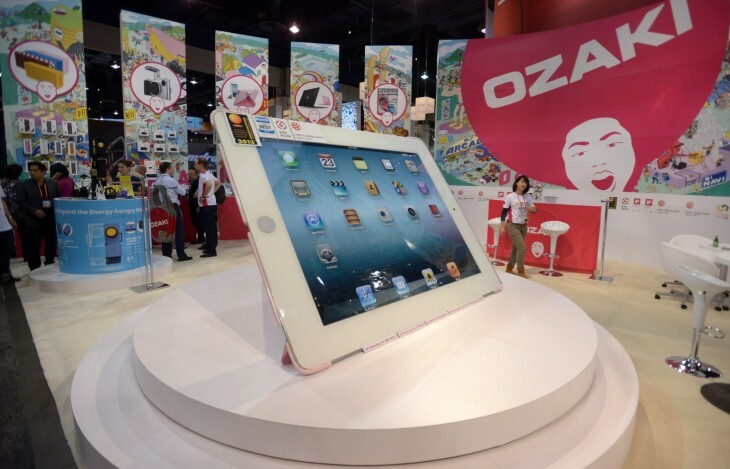 The Taiwanese company managed to move into the number three vendor spot, largely thanks to tablet shipment demand from Google’s highly-marketed Nexus 7 device. Amazon fell to the number four spot, despite seeing 189.6 percent year-on-year growth. Still that only amounted to 1.8 million units shipped, as IDC rightly blamed the company’s vulnerability to a highly seasonal product cycle. Rounding out the top five was Microsoft, which entered the list for the first time as shipments of its Surface RT and Surface Pro tablets combined for a total of nearly 900,000 units (total Windows 8 and Windows RT shipments across all vendors reached 1.8 million units). The company managed to displace the struggling Barnes and Noble, but it is still facing a very upwards battle. 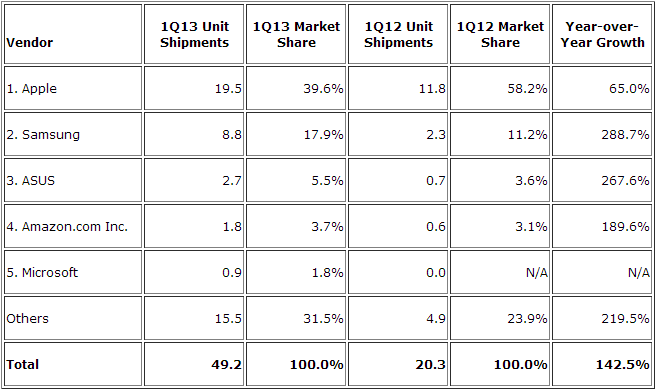 In Q1 2013, Android managed to capture 56.5 percent market share while iOS grabbed 39.6 percent. You might be wondering how this is possible given that Apple is still completely dominating in terms of total tablet shipments. The reason is simple: there are many vendors that don’t make it into the top five. 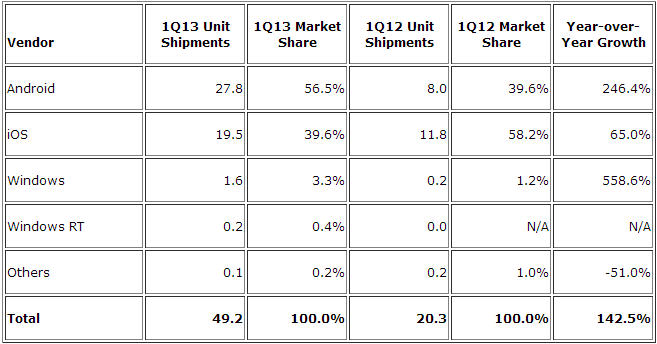 They all choose Android (and Windows), while there is just one vendor that can sell iOS devices. Going forward, we can expect Apple to continue slipping and Samsung to keep gaining, but that trend seems to be a slow one. The interesting changes will occur in the remaining three spots: this quarter alone we saw a displacement and a newcomer. Asus will have trouble holding onto its third place position, unless it also happens to be the manufacturer of whatever Google announces at its I/O conference next month. Amazon will meanwhile be looking to move its way back up, probably with a new round of products at an even lower price point. As for Microsoft, the company will likely hold onto fifth place, but likely won’t be able to budge without Asus suddenly dropping. In other words, the next few quarters really depend on what Google has up its sleeve. Apple and Samsung will keep doing what they’re doing without much change, while Amazon and Microsoft will continue trying very hard to make a name for themselves.